The world’s greatest GM screen has been lauded at length on Held Action. I wound up upgrading to the landscape edition shortly before fading out of GMing games almost completely, so I never got the chance to enjoy it, but I loved its sturdiness and universality. The one drawback that screen has, which the landscape orientation helped mitigate, is that it’s so thick and sturdy than it can muffle your voice. At home, that’s probably fine, but in a convention setting, where I was doing most of my GMing, having your voice cut down in a noisy room is a killer. I would be remiss in passing on the word that the game convention near and dear to my heart, Carnage, has opened up their event submissions to GMs eager to run games. The game submission form is right there on the Carnage website. As for my own endeavors, I haven’t quite decided what to run this year. I know I’ll do a Ghostbusters game. And after the test run of my GURPS Cabal mini-setting of Martense College, I’d like to go back there, but with a better idea of what to do and how — less “step and fetch it,” more dizzying possibilities and lunatic history. We’ll see. Five months is an admittedly long time to think and plan. And I have until the end of July before they get serious about cutting off material to fit in the convention book. Catching up on some neglected listening material over the long weekend, I took in a Pelgrane Press seminar from Dragonmeet 2011, courtesy of Yog-Sothoth.com. Featuring Robin Laws, Kenneth Hite and Simon Rogers, the conversation centers on the many endeavors of Pelgrane Press and related topics. One digression in particular caught my interest: what the spending of points — GUMSHOE points in the context of the conversation, but easily widened to any mechanic where a player spends points to effect a change — signifies to the GM. With drama points, that change-up is probably to do with the player not being happy with what the GM’s saying: “Your character takes a blow to the head” or “You don’t find anything of interest in the warlock’s study.” If they’re spending points, they’re not happy about something. Outside of the immediate redress of “Oh, it was a glancing wound,” I think it’s a good mindset to take those spends as an opportunity to ramp up engagement by giving them exceptional carrots. In retrospect, I find it easy to fall into a habit of being stingy with handing out exceptionally nice carrots. When I was running Scions of Time last year, I think part of the reason the players didn’t take advantage of the drama point mechanic, aside from the frequent lack of need for the mechanical benefits, was the gain was rarely terribly interesting. I was too afraid of action going way off the pathways I was prepared to follow. In fact, I think Should’ve Said would offer a fun two-way exchange. Players spend points to get the GM to change what he’s saying. The GM hands out points to get the players to change what they’re saying. It’s a little like the Fate point economy with aspects and refreshes, I think, but Should’ve Said includes the ability to keep pushing. The player can spend another point, or more, and the GM can keep handing them out until they hear something they like. What Does a GM Do During Character Creation? As a GM, time spent during character creation can seem dull. You don’t get to join in until it’s over. That doesn’t mean the players aren’t having a rich experience. The designer/GM must see past his own wandering attention to see how engrossed the players are. Prep can be a tedious slog, or it can be play. If it is play, a design might be ill-served by streamlining efforts that rush players through a process they’d sooner linger over. This is a personal failing of mine. I get hugely impatient during character creation. Even when there’s a surfeit of books for players to reference, finding entertainment in their internal processes is not something I’m good at doing, or have even thought to attempt. Character creation is certainly an interesting time. In a lot of games, it’s the time when the players have the most creative control. They’re calling the shots about who their character will be, at what their character will excel. Around a table of excited players, concepts come flying thick and fast, so that it can be difficult to pick just one on which to focus. It’s also the time when a GM can start gathering information about what the players want to see in the game. You can infer from the choices they make in skills the tasks they expect to tackle in the course of the campaign. So take that opportunity to either figure out how to accommodate their expectations or let them know those points or slots could be better spent in other ways. And no, no, it’s not enough to declare that the adventure is tracking down the first of twenty-one spider sculptures fashioned by Leonardo da Vinci, each containing one part of a device designed to travel to Mars, which is hidden in a steamer trunk behind the wall of a Boston brownstone, guarded by fleas the size of rats that are sucked on by fleas the size of cats. Oh no. The academy chairman also declared scoring criteria, in which players on the adventures fill out a ballot with sections asking questions like: “How well the theme ingredient was incorporated into the game (1-5 points). Were the unique traits of the ingredient brought to the fore by the GM, or could something else have been substituted without much change to the adventure? Pandemonium’s anniversary celebration runs through the weekend of November 12th through the 14th, with schedule slots for the Iron GM challenge on Friday, Saturday and Sunday. Hie thee hence, Boston area role-players! I consciously work against this most of the time. During the Labyrinth Lord game, during a melee with a clan of troglodytes, I found myself scouring memories of Labyrinth of all things for inspiration on how to inject some humor into a bunch of short little putzes taking on a party of adventurers. Two elements I used were physical comedy in how the troglodytes attacked — usually expressed by mimicking their over-enthusiastic axe-swinging and fooling with over-sized helmets; headgear of any kind can be a great physical prop for a character to fiddle with or struggle against — and voices. I decided to play these guys high and squeaky, like the goblin hordes of Labyrinth. I think I confused everyone who’s actually familiar with the source race, but it seemed to work for the moment and gave me another characteristic around which to build a lively presentation. In the summer of 2009, during her Mags the Axe School of Gamemastering series on All Games Considered, the titular Mags mentioned an adventure outline she found useful in devising adventures that she picked up from a seminar course conducted by Guy McLimore and Poehlein at Gen Con in the early 1990s. It’s an adaptation of the kind of beat sheet television and film writers use to map out the rises and falls of a story. I found it pretty useful last year writing Lurker in the Lobby and Highway to Niflheim. So I went to find the file tonight to help lay out the structure for my next two, only to fail to find it on my hard drive. Turns out I just wasn’t being clever enough about search terms, but that did send me off to the Nachtmedia community, where the PDF is still available for download. With the demise of many Ning networks, you can still find Greg’s outline available as a PDF at the top of All Games’ Considered‘s links for the original episode. If you’re new to writing role-playing adventures or having a hard time getting started, a form like Greg’s is a great place to start. Filling in the blanks helps you not only order your thoughts, but see what elements you may not give due consideration. Thanks again to Mags for doing the legwork to make this available to the general gaming public. March 4th is GM’s Day — “march forth,” geddit? — a time to give recognition to the hard-working game masters who put the time and energy into creating the imaginary worlds in which our characters run amok — and, in the convention world, care enough about their game of choice, role-playing, board or otherwise, that they’ll teach it to a table of strangers. 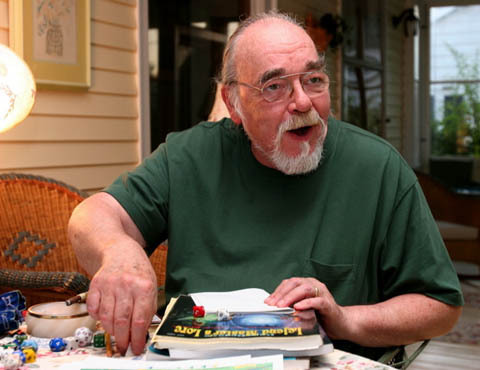 He's Gary Gygax and he is *roll roll* . . . pleased to meet you! The idea for a day to recognize GMs came up back in 2002 on ENWorld. Gary Gygax‘s passing on the same day in 2008 cemented the date . Now it’s become not only an occasion to thank one’s GM — possibly with the purchase of role-playing books, as RPGNow would like you to do, given their massive sale; so massive, in fact, I’m having difficulty finding anything I want amidst the torrent of niche material — but a day commemorating the role-playing hobby on the whole and remembering its proud parents, Gary Gygax and Dave Arneson. The hobby wouldn’t be what it is today, or maybe even exist at all, if not for Gary, Dave and everyone else who participated in the conception of Dungeons & Dragons. I plan to mark the occasion with game night in the traditional sense tonight: friends getting together at someone’s house for food and tabletop fun. It’ll be board game tabletop fun, in the shape of Age of Empires III, but still. And this weekend, a Savage World of Solomon Kane one-shot in Rutland. One of these days I will get on the ball and have something really appropriate planned to run on GM’s Day, or get the local store involved or something. TARGA‘s International Traditional Gaming Week isn’t that far off. If I’m industrious and persuasive, I’d like to get some people together for an old school dungeon crawl. There’s no dearth of dungeons and retro-clones to utilize, after all. Thanks again, Gary and Dave. You invented a truly unique hobby, which I and so many others love dearly.